We produce ready-to-print, Semester One and Two, Mathematics papers with marking keys for Year 11 and 12 WA Math ATAR courses - Applications, Methods and Specialist. All math exams have two sections. Section One is calculator free, weighted at 35% and typically comprises of 7 or 8 questions totalling about 50 marks to be answered in 50 minutes. 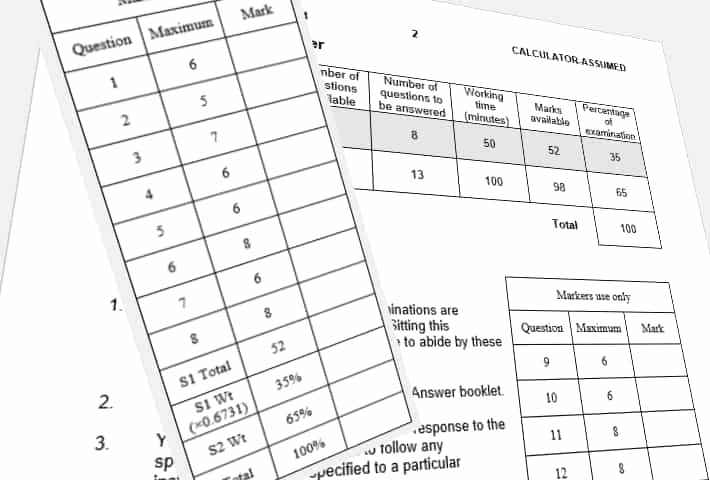 Section Two, weighted at 65% and typically 12 or 13 questions totalling about 100 marks to be answered in 100 minutes, assumes use of a CAS calculator. If you are the Mathematics coordinator and authorised by your school to make purchases, make sure you have read our terms of sale, are aware of key dates that may affect when your students sit current semester exams and then click the button below. Past papers and their marking keys are supplied as pdf documents. Take a look at a sample of the opening pages of one of our Math papers. Schools can now opt to purchase premium Math semester papers. More info. Schools will receive two versions of our Year 11 Semester One papers. One version will cover all three Unit One topics and the other version just the first two topics, in case classes do not complete all of the unit before Semester One exams. 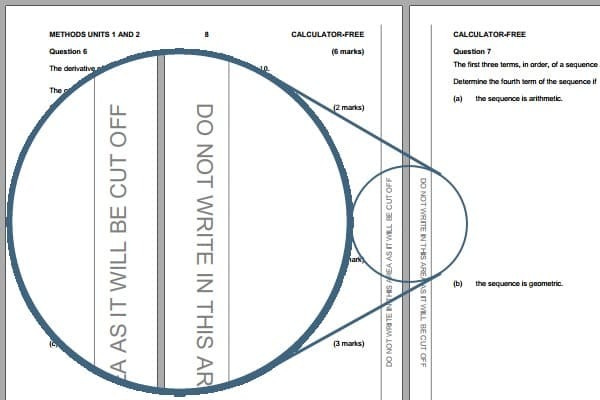 Unique to WA Exam Papers, if you choose our Premium Paper option, we guarantee that in any exam, fewer than half of the questions in your paper will be the same as those in any other exam supplied to any other WA school. Click here for more info. Another great feature we offer is the option to anonymously share the results of your students with those from other schools. Click an image for larger view in popup. This median boxplot displays the distribution of the means of 37 schools for an exam with an overall mean of 60. The blue marker shows the school cohort of 28 students had a mean of 63. This chart displays historical data for one school for all six courses since the new courses began. Each data point is the calculated difference [School Mean] - [All Schools Mean] for an exam, where the means are in percentage form.